One of the easiest types of desserts to make is the no-bake kind. We’re talking about easy to mix up, easy to dish up and even easier to eat up. Dessert recipes that are creamy and delicious are high on our radar for adding to our meal plan. When we’re not going for raspberries, we like to dive into an Apple Caramel Cheesecake Parfait, Snickers Cheesecake Parfait, and Smores Icebox Cake. Get your fork ready! It’s time for dessert. We find it even easier to make these tasty no bake desserts when the weather warms up. There is just something about a cold dessert that doesn’t require baking that is so satisfying. 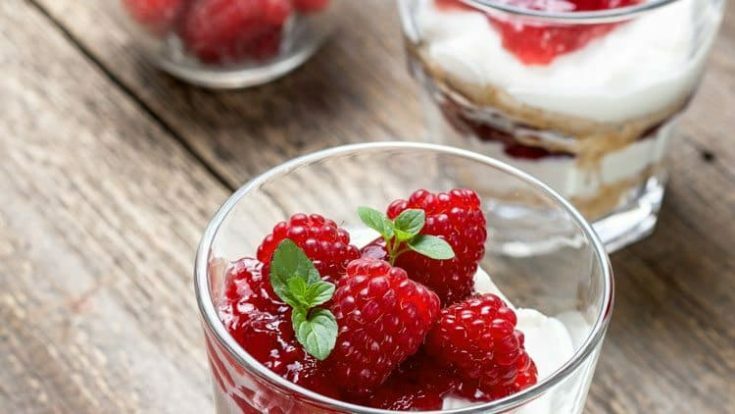 When you get the chance to pick berries straight from the berry patch, making these delicious desserts is even more appealing. We had a nice crop of blackberries this year, and this easy no-bake cheesecake recipe would be just as tasty if you substitute blackberries. You could also try it with blueberries or strawberries. 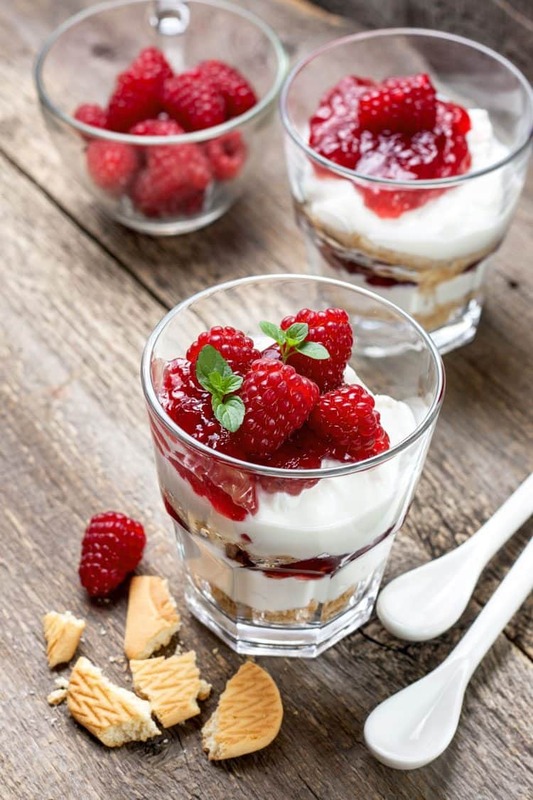 Any way you make it–with whichever berry–you’re going to love savoring bites of this yummy dessert. Dish it up and eat this dessert recipe nice and slow. You don’t want to miss out on any of it’s tasty flavor. Place the crushed cookies into a mixing bowl. Add the melted butter and mix until the completely moistened. Press the mixture into the bottom of each of 6 parfait dishes. Place the cream cheese into a mixing bowl and mix on low until smooth. Add in the sweetened condensed milk and mix again until well incorporated. 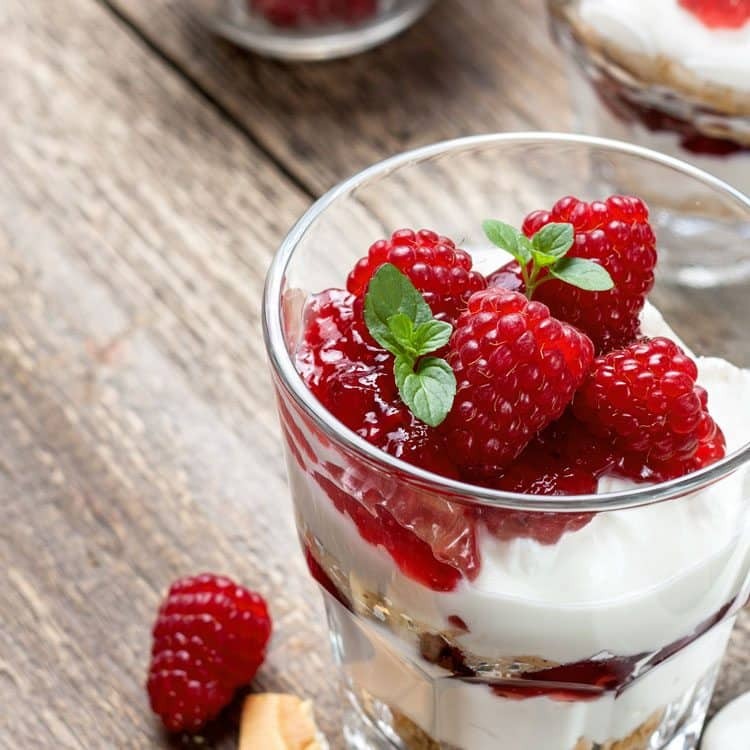 Distribute the raspberry preserves between parfait dishes. Top with cheesecake mixture and then top with raspberries.